The Pez dispensers in Kathleen Lynam’s home aren’t hidden away, but neither are they the first thing you see upon stepping inside. To view them one must pass from the more formal living room through the kitchen to the back-of-the-house living space, where large windows gaze upon the trees surrounding the home. Here the Pez collection quietly catches one’s fancy as it smiles down from its room-circling shelf near the ceiling. There’s something very Lynam in that. Tall, slender, dark-haired and gentle yet energetic, Lynam greets you as any comfortably situated family woman might. But step a bit further into her confidence and the creative quirkiness that feeds her art shines through. And you quickly find yourself smiling in response—even before she’s brought out her singing, dancing, story-telling, lesson-teaching puppets. Both a performance artist and a visual artist, Lynam has been a self-taught puppeteer since the early 1990s, but one senses addendums to that artistic title could easily be lurking close by. With puppetry, she says, “There are so many different creative outlets. It keeps it fresh and interesting.” From painting, sculpting and sewing the puppets to writing the scripts, poems and songs for their shows to performing the shows and connecting with audiences, Lynam engages creativity from myriad angles. The puppets begin with a character, and, before they’ve received physical form, “they have a name, a personality, a voice, and a purpose,” says Lynam. 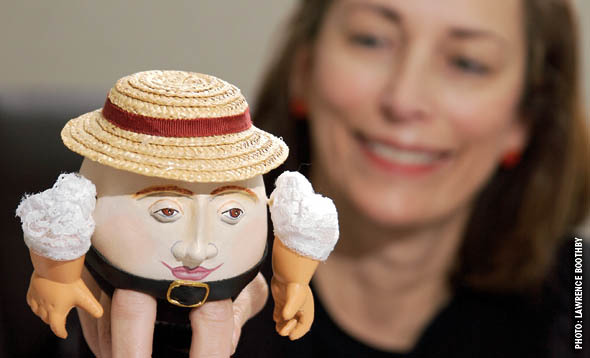 Often working at her kitchen table, she creates five different types of puppets: finger puppets, rod puppets, glove puppets, hand and foam puppets, and weird-object puppets. Like her kitchen, Lynam’s car serves as another type of studio. She keeps it quiet—never driving with the radio on—because this is where she gets much of the inspiration for the words her puppets perform. She writes down ideas and records songs in this mobile incubator. Lynam and Bob, her husband of almost 35 years, moved their family to Franklin from Connecticut in 1988. Shortly after their move, Lynam stumbled on the art of puppetry while seeking to help their youngest son, Brendan, with his difficulty keeping sustained attention. 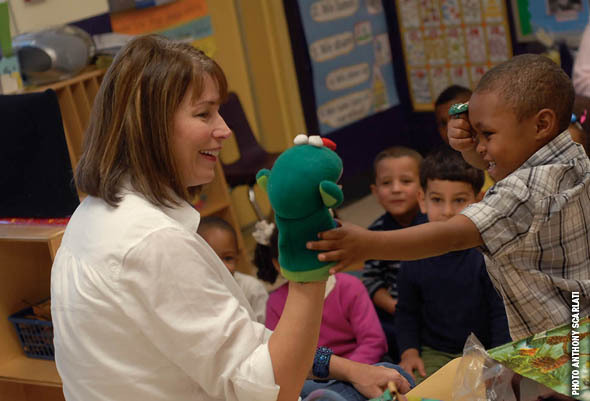 When she created a puppet to tell him stories, he was able to sit through an entire tale for the first time. Though she hadn’t been looking for a career outside of staying home with her children, which she loved doing, she felt compelled to share this epiphany with others, knowing there were other children in Brendan’s position. Twenty years later, she’s surprised by “how much I still love it, how fulfilling and satisfying it is as a career. I took what I love and made it into a job.” Her professional affiliations include serving as a master artist with the Wolf Trap Institute for Early Learning through the Arts, a teaching artist with the ArtSmart program, and a Kennedy Center artist. 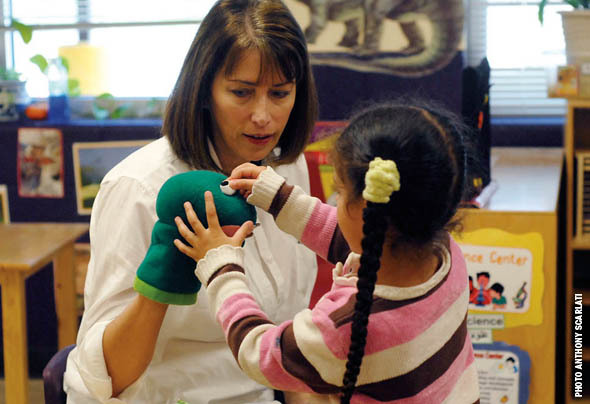 Now Lynam spends much of her time in schools, using puppets to teach elementary and pre-school-age students and training teachers to do the same. She is more confident as a performer, and she and her puppets are fully visible now, surrounded by students, providing an interaction with her audience that she loves. Lynam’s puppets bring to life the books and concepts the students are studying. A caterpillar glove puppet transforms into a butterfly. Humpty Dumpty’s great fall—her prequel to the nursery rhyme explains that Humpty was on the wall because he didn’t obey his mother—teaches students about respect and safety. A Picasso puppet helps prepare older students for a visit to a Frist Center exhibit. Lynam loves the challenge of helping teachers add art to what their students are studying. “It’s always new and unique,” she says. “They give me a problem, and I come home and work on it.” Sometimes the “problem” is figuring out a way to teach a life skill; sometimes it’s an academic subject; sometimes it’s literacy, and sometimes it’s language learning for students learning to speak English. “The teachers and the children are inspirations for my work,” she says, smiling. The Head Start students “call me Miss Gasoline because they can’t say Kathleen. It’s the best job ever. I walk into the room and they cheer. The boys brush off a seat for me. They give me hugs. I try to bring as much magic and beauty as possible into their lives because they don’t have a lot of that.” The best job ever, indeed.